Vauxhall Corsa- Fails MOT Test- Because of Worn Out Front Suspension. New Lambda sensor fitted after the emissions test failure. (power steering) which makes the little car easy to maneuver and along with its good rear end visibility makes the car easy to park and is a favorite with the lady drivers. The car was launched by Vauxhall in 1993 and has proved to be a very successful model for the giant car company. The car has also remained cheap to buy, both new and second hand. We recently purchased a Vauxhall Corsa from one of our lady customers, to be used as one of our courtesy cars, and it has proven to be a little gem and popular with our lady drivers, who use the car when leaving their own car for servicing or repairs. The Corsa has a few drawbacks; it is not for the taller person and the car is very cramped when driving with four adults, (two fronts and two rears), they are also not very suitable for the out of town open road driving. They are noisy due to road and engine noise and they do not corner very well, especially with a full car of adults. However despite this the little super mini is very popular amongst younger people, as this is the first car than many first time drivers can usually afford , Corsa’s can be found at bargain prices and as I have said earlier the lady drivers love to drive them around town and they are easy to park. choice for the economically minded driver. The insurance is also very low, most normal sized engine cars come into the lowest insurance groups possible. The Corsa is also cheap to service, making the car as I have said earlier cheap and economical to run, favouring the money conscious lady drivers and the young first time car buyers. These little cars are usually trouble free when it comes mechanical problems apart from the usual wear and tear items such as tyres, exhausts and suspension and brake parts, but there has been a few recall problems with cars between 2000 and 2006. One of our long standing lady customers dropped off her carfor a service and an MOT test. She said that the car was in excellent condition and should walk the test. Dale Linton tested the car and found that all sorts of things were wrong. The steering and suspension had lots of play in them, the car also had a broken spring and also failed the emissions test. We always phone our customers before working on their car and we always save the old parts for them to look at. fit new control arm bushes, but this takes much longer and by the time you have removed the old bushes and fitted new ones, we can fit a complete new arm. The costs work out about the same because of the labour factor. We fitted a new lambda sensor and a new spring before re-testing the Vauxhall Corsa and then servicing it. The car is now a far better ride than when she brought it in and the lady customer noticed this and thanked us for our great service. 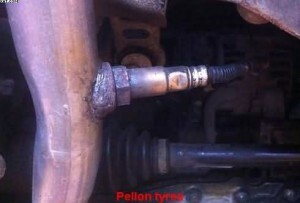 Pellon Tyre and Auto-centre offer car and van servicing and car steering repairs to all makes of vehicles. We are members of Unipart Car Care centres and give a nationwide guarantee for all our work and parts. We also sell tyres online from our website www.pellontyres.co.uk by using the tyre selector and choosing your tyre size. We offer courtesy cars to local motorists who need to go to work and leave their car with us for work doing. We are also an official MOT testing station and are members of Motor-codes, who carry out checks for high standard of equipment and workmanship. https://www.pellonautocentre.com/wp-content/uploads/2015/06/Logo_PellonCleanTrans.png 0 0 Eric https://www.pellonautocentre.com/wp-content/uploads/2015/06/Logo_PellonCleanTrans.png Eric2018-06-10 17:19:392018-12-30 10:37:59Vauxhall Corsa- Fails MOT Test- Because of Worn Out Front Suspension.